In this month’s blog, we wanted to look at what doesn’t work for a website. We have explained in the past about what works well but we should also be telling you about what doesn’t work! Web design is not just about making it look pretty. Functionality is a key component to consider for any web designer and here at Dog & Pig we focus on this for you, every time. Firstly, let’s look at the difference between a web designer and web developer. Designers will keep in mind your brand, the look and feel of the website from an aesthetic perspective. This means that they will investigate your brand message and consult with you over a design brief. This is the ‘making it look nice’ part. A website developer will spend the time looking at ‘usability’ of the site and making sure that the functions work and that all the navigations work as they should. They will even look at call to action elements too which will help with conversions. It is great having a good looking website but if it doesn’t help users to convert into business then what is the point? In case you were wondering, we are both designers and developers so we have both hats on when we are ‘in the zone’ creating your new website. You will never see a broadsheet newspaper use a wide range of different fonts and they always (about from headings and sub headings) will be the same size. This is because it is easier for the person reading to comprehend. There is nothing worse than seeing two different types of font being used as well. Unless instructed to by our client, we would strongly advise against that. Every website should have call to actions. If you are unsure of what we mean by this, then look at this way. If you are spending money and time in driving traffic to your website, a ‘call to action’ is what take your website visitors to the next stage. Effectively, you are directing them to the areas of the website where you want them to interact with you. These can often be ‘Contact Us’ or even ‘Enquire Here’ buttons. For an ecommerce website, you will always see a ‘Buy Now’ button. Also, it is worth noting that sometimes it is worth looking to use a different colour to your website theme and colour branding. This is because it will stand out from the rest of the website. We would also advise perhaps to use a ‘go colour’ like green. Try to avoid red please because we always stop at a red sign or it can signify danger. Think of this the next time you are sitting in traffic waiting for the lights to change! According to several leading web traffic analytic sites, just over 50% of web traffic is generated through a mobile device. With the rise of smart phones and people having instant access to the Internet on their travels, long gone are the days of the home PC sitting in the corner of the room. 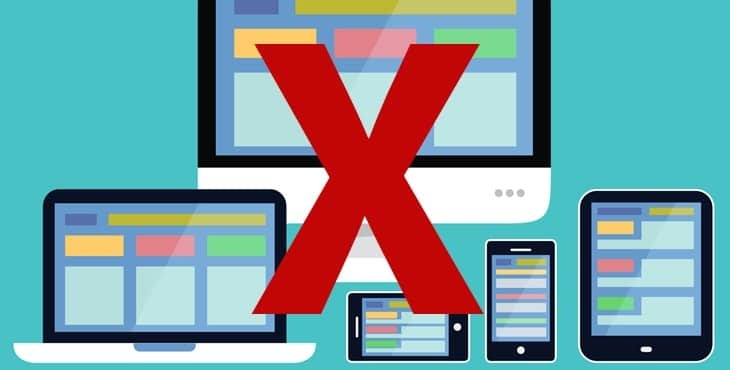 So, having a website that is non responsive will actually make you outdated and it may simply turn people off. All the websites we build are responsive to smart devices and tablets too. They have to be in today’s world. We have all seen a website where you simply do not understand some of the terms being used by the company. Keeping the ‘jargon’ to a minimum is always ideal as not all your users will know your industry or sector as well as you. Website content should be written with all types of visitors in mind. We can hear you saying now that you have a very specific niche who will understand. In that case, consider catering for the people who don’t by linking key terms to a glossary. There is a fine line between showing off your knowledge of your business sector to simply making your content unreadable. We just had to include this one into our list of web design mistakes because it is easy to write the bare minimum. Even for this blog, we could have simply listed the mistakes and not elaborated on the key points. Content is King and it always will be. With Google being a text reader, having key content on your website will help you with your SEO. It is not about how many times you mention ‘hair dressers in Cambridge’ it is also about the flow of the content and ensuring that a full range of ‘readable’ content is available. The more content you have the better. The more you can expand on key points within your website content, the more you will be seen as a authoritarian figure in your industry. Your goal of getting them to the website is only half the job. Keeping them interested and online is the other half. Our advice is to look at your competitors and see what they have online. Do they have more content? Is their content better? Have they put more time in their website? Lot’s of questions to consider but worth the time to do this inventory. As we (the general public) become more time poor, we are not to be hanging around whilst a website is loading. The longer people wait, the more chance they are going to hit the back button and perhaps find one of your competitors. A large percentage of website visitors will not revisit your site in the future if the load speed is likely to be more than 3 seconds. 3 Seconds is all ‘people’ really have because people want information to hand and they want it now! There are ways to combat this by stripping a site down of large image files and unnecessary video files. You can even look at creating shorter pages than long pages. Every web designer and/or web developer will have an opinion on all of these points raised and there are more than just 6 points to note. These were the ones that we felt were important to mention. We are always on hand to discuss your website requirements as and when you are ready. Get in touch here.